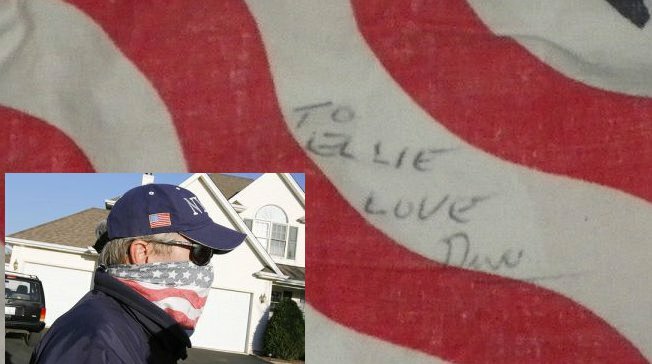 Drew Peterson’s bandana is signed to ” Ellie” Brodsky, wife of his former attorney. The last time it was his a motorcycle. 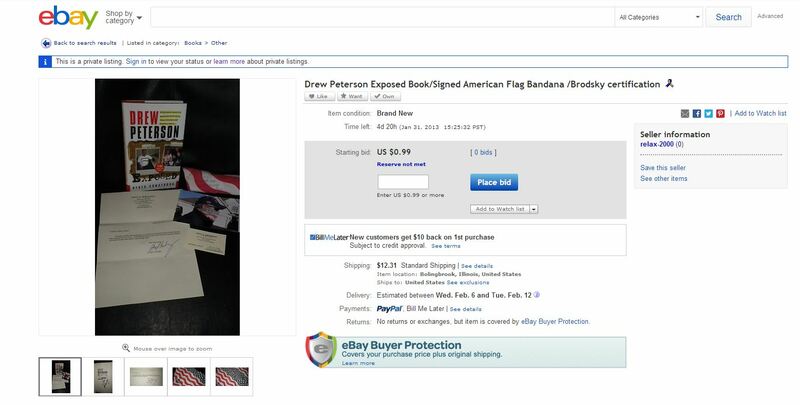 Now convicted murderer Drew Peterson’s famous American flag bandana is being auctioned on eBay. Picture of Drew Peterson wearing the bandana filmed by numerous News Networks. Picture printed from one of the News internet websites. Although the item location is given as Bolingbrook, Illinois, it’s evident that the items were at one time all owned by Peterson’s former attorney, Joel Brodsky and his wife Elizabeth “Ellie” Brodsky. Mrs. Brodsky tweeted earlier this evening that she believes in Drew Peterson’s guilt and hopes he does not get a new trial saying, he “creeped me out”. According to the listing, 20% of the sale will go to the nonprofit Mutual Ground Inc. in Aurora, Illinois, which provides services for victims of domestic violence and sexual assault. Is Mutual Ground even aware that they have been named as a recipient for this auction? This letter certifies that the signature on the American Flag scarf is that of Drew Peterson, and he signed it in front of me. 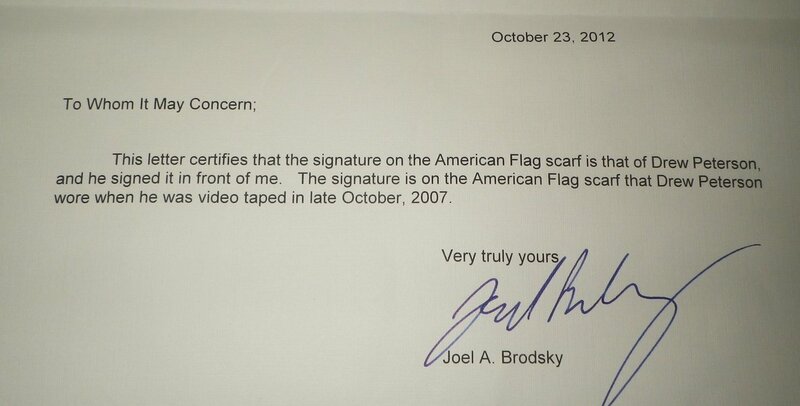 The signature is on the American flag scarf that Drew Peterson wore when he was video taped in late October, 2007. Could it be that Joel Brodsky is still interested in profiting from his relationship with Drew Peterson? If he really wants to do some good, why not donate 100% of the proceeds or better yet, just burn the bandana and make a donation? Will this auction be allowed to run its course, or will it be pulled from eBay as the auction for Peterson’s motorcycle was? UPDATE 1/27/2013: According to Elizabeth Brodsky, Drew Peterson signed his bandana and gave it to her thinking it was “cute”. Years ago she gave the bandana to an employee of the University Club because she didn’t want it in her house. According to her the man said that he lived near Drew Peterson so she replied, “Good, here, you can have souvenir” and bestowed it upon him. She hasn’t seen the man lately and wonders if he is now unemployed. No explanation though as to how Joel Brodsky came to write a letter of authenticity for the item three months ago (right after he stopped representing Peterson), nor how the man also came to have the book signed by both Drew and Joel, and one of Joel’s business cards. Old friend of Drew Peterson’s, Dr. Dan Budenz, has chimed in to claim that he is also an owner of a Peterson-signed bandana, which was signed and given to him when Drew took his kids to spend Christmas of 2007 in Florida as his house guests. Budenz later went on to self-publish a bizarre book about the Peterson case. 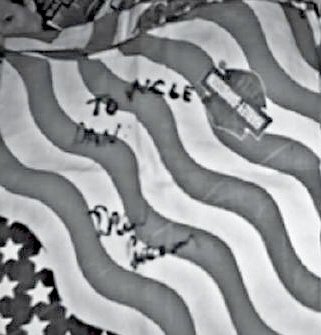 The bandana bears a personalized autograph to “Uncle Dan”. Budenz claims that his is the bandana Drew wore on camera in October 2007. Budenz says that his bandana is not for sale. UPDATE 1/31/13: The auction has ended with only one bid of 99 cents. The reserve was not met so the item went unsold. In a final pre-sentencing attempt to spring Drew Peterson or to at least get him a new trial, more documents were filed on Thursday claiming that Joel Brodsky did a terrible, awful, downright erroneous job of defending his client, Drew Peterson, against the murder charge for which he was convicted three months ago. While the memo singles out attorney Brodsky, claiming that he “singlehandedly deprived Drew of his right to effective assistance of and conflict-free counsel”, a finger is also pointed at Judge Edward Burmilla for allowing testimony to be heard from attorney Harry Smith, in an alleged breach of attorney client privilege. Attorney David Peilet, who stepped in as lead attorney when Joel Brodsky withdrew from Peterson’s defense, filed the memo which was penned by Steven Greenberg. The state has until January 10, 2013 to respond. I can’t recall the first time I heard of Susan Murphy Milano. I know it was in the first few months after the disappearance of Stacy Peterson and the re-examination of the events surrounding what was initially ruled the accidental death of Kathleen Savio. Most likely it was a post on her blog that came up during a search for information, or maybe someone left a link to a podcast of the show Justice Interrupted hosted by Susan, Stacy Dittrich and Robin Sax. Whatever the case, I was immediately struck by her passion, her energy and her fearlessness when it came to discussion of not only the anti-hero Drew Peterson, but the system and the players who had failed his two wives and especially Kathleen Savio. Even after run-ins with Drew Peterson’s lawyer, Joel Brodsky, Susan still spoke her mind about the case with a sharpness and sense of humor that showed everyone that she was not the kind of person who could be easily intimidated. This summer I was very sad to learn that Susan Murphy Milano was diagnosed with stage four multi-organ cancer. This month she made the decision to suspend treatment and allow the natural course of events to take place as they will. This decision coincides with the release of her latest book, Holding My Hand Through Hell, which is Susan’s autobiography and a fitting swan song to her life as a tireless champion of the abused. Susan’s story begins in a middle-class home in Chicago, presided over by her alcoholic police officer father, whose horrific abuse of the family is told with Susan’s typical candor. The helplessness she felt when law enforcement would look the other way out of “professional courtesy” will strike a chord with anyone who has been following the Peterson cases. The eventual murder/suicide of her parents started Susan on a crusade to aid and empower victims of abuse – an effort that touched the lives of many women and gave Susan a measure of celebrity but which also took a toll on her private life, straining relationships with those closest to her and even alienating her son. Susan takes you along with her as she experiences her hopes, her victories and her disappointments, the struggle to trust and love after growing up in a violently dysfunctional family, and the relentless drive to help others even when her own life has been shattered and then pieced back together and held in place by the barest of support. Three years since Drew Peterson’s arrest for murder. What has changed? On Monday it will be three years since Drew Peterson was arrested and charged with the murder of his third wife, Kathleen Savio. Since that day he has resided at the Will County Adult Detention Facility in Joliet awaiting trial. So, what has changed since May 7, 2009? Today: At a pre-trial hearing on May 4, 2012 Peterson’s defense team indicated that they could be ready to go to trial in 60-90 days. Today: In September, Attorney Walter Maksym was asked to “step aside” from the legal team after he was criticized by the federal appeals court for filing “unintelligible” court papers that were “riddled with errors”. As the case nears trial, it has been announced that Atty Joe Lopez will present closing arguments. One Year ago: After months of rumors of arguing and even a physical incident, Reem Odeh left the partnership and withdrew from the Peterson defense team in September 2010. In February of 2011, Lisa Lopez, wife of Joe Lopez, assisted with the oral arguments regarding the hearsay decision before the Appellate court, which were presented by Steven Greenberg. Two years ago: Andrew Abood and George Lenard withdrew from the case in April of 2010, citing irreconcilable differences with Joel Brodsky. John Paul Carroll had a complaint filed against him in September and appears to have left the case. Attorneys from Brodsky & Odeh, Steven A. Greenberg and Associates, Law Offices of Meczyk Goldberg, Joseph R. Lopez, P.C., and Walter P. Maksym Jr. then made up the “Seven Samurai” representing Peterson in court. Three years ago: Brodsky & Odeh, Abood Law, and John Paul Carroll represented Drew Peterson. George D. Lenard joined the case in December of 2009. Today: The Sun-Times continues to shill for Peterson. On April 17 they featured a sympathetic story and cover photo of Drew Peterson after the state won their appeal to get more evidence admitted to his trial for murder. One year ago: Despite the gag order prohibiting interviews, Peterson spent 2011 writing letters and statements that were provided to the media, in particular to gossip columnist for the Chicago Sun Times, Michael Sneed. Two years ago: Drew was prohibited from giving interviews to the press. Three years ago: Drew’s last interview was given over the phone to a WLS radio show host, Eric Mancow Muller, from jail on May 27, 2009. He also gave one other in-jail phone interview on May 15, to Matt Lauer of the Today show. Today: On May 4, 2012, Judge Edward Burmilla was assigned to the case. One year ago: Judge Stephen White retired in October 2010. Two years ago: Judge Stephen White presided over the case. Three years ago: Judge Richard Schoenstedt was first assigned to the case; then Judge Carla Alessio-Policandriotes and finally Judge Stephen White. Will County Chief Judge Gerald Kinney made the new appointments. Judge Daniel J. Rozak set Peterson’s bond. Today: After the appellate court did not reconsider the barred hearsay statements due to a missed deadline, the State appealed to the Illinois Supreme Court which decided that the appellate court should consider the evidence on its merits. In April the appellate court reversed Judge White’s decision and decided that the hearsay statements were reliable and admissible in court. Peterson’s defense announced that they would not appeal and wanted instead to go to trial. One year ago: The judge’s decision regarding the hearsay statements was leaked in July 2010, revealing that possibly fewer than five of the 15 statements being considered were to be allowed. This decision was appealed by the prosecution. During February oral arguments before the appellate justices, States Attorney Jim Glasgow was asked what he now wanted to “hang” his argument on. Glasgow said that he chose “804 (b)” or, in other words the common law doctrine that is part of the Illinois Rules of Evidence (rather than the so-called “Hearsay Law”). Two years ago: In October 2009, Peterson’s defense lost a motion to declare the act unconstitutional. Hearsay evidence and witnesses were heard during hearings in January 2010. Today: In June 2011, the Annoyance Theater in Chicago presented a satirical play, Waiting for Drew Peterson, about two sisters obsessed with Drew Peterson. In January of 2012, the Lifetime movie network aired the movie, “Drew Peterson: Untouchable“. Based on Joe Hosey’s book, Fatal Vows, it broke all viewing records for the network. In February of this year, the Raven Theater of Chicago presented, Dating Walter Dante, a play inspired by the love life of Drew Peterson. Today: Stephen Peterson is still appealing his dismissal. His next court date is scheduled for May 9. One year ago: In August 2009, Stephen Peterson was suspended for accepting and hiding weapons for his father, shortly after the disappearance of Stacy Peterson. In February 2010, Peterson was fired from Oak Brook Police Force and appealed his dismissal. Thomas Peterson wrote a letter and made a filing asking to be removed from the Savio family’s civil suit against Drew Peterson. This has not been granted yet. Tom Peterson was chosen as valedictorian of his graduating class. Three years ago: Drew’s four youngest children were left in the care of their step-brother, Oak Brook Police Officer, Stephen Peterson. Today: Gossip columnist Michael Sneed reports that Peterson has over 20 pen pals (male and female), at least four of whom contribute to his funds at the commissary so that he can enjoy snacks while he awaits trial. One year ago: In August 2010 we heard that Christina Raines was engaged to a new man. 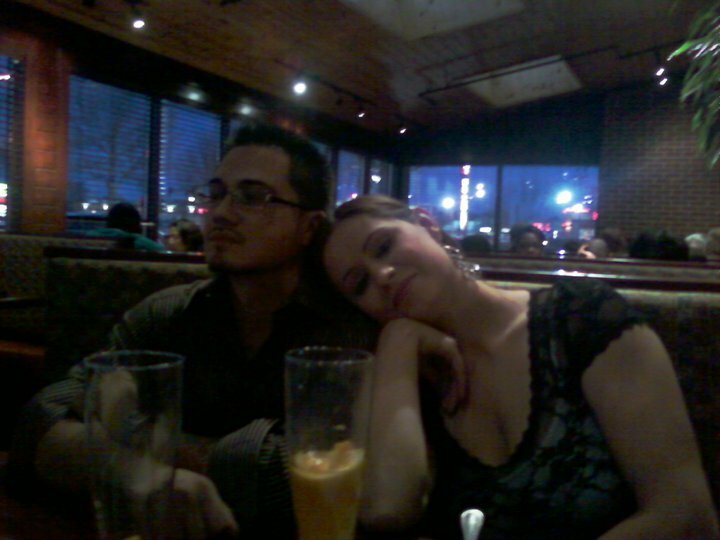 In February 2011 we obtained a photo of Chrissy with her fiancé. In April 2011, an old acquaintance of Drew’s, Diana Grandel, released some letters from Drew in which he made sexual comments to her and offered Stacy’s clothing to her. Three years ago: Christina Raines was at the house that Drew and Stacy Peterson shared at the time or his arrest and was also taken into custody. She removed her belongings from his home shortly afterwards. Raines is on the list to visit Drew in jail. Today: Besides frequent mundane snippets in the gossip columns about Peterson’s life in prison, all has been quiet. One year ago: While Drew’s bids for attention have been mostly curtailed due to his detention, his lawyer and PR people continued to pepper the news with updates and letters from him detailing everything from his life in jail to his opinions about the legal decisions regarding his children. Kathleen’s oldest son, Tom, was the subject of news stories and wrote his own letters to the press in support of his father. Two years ago: Soon after Drew’s arrest he attempted to have his motorcycle auctioned off on eBay. He was asking for $50,000 and offered to apply a decal with his signature on the bike. eBay removed the auction for violation of its “murderabilia” rules. Three years ago: At the time Drew was arrested, he was preparing to fly out to the Bunny Ranch Brothel in Reno, Nevada, to see if he would be a good fit as head of security there. Today: Airings of the movie, “Drew Peterson: Untouchable” brought about some new tips and offers of assistance in regards to the search for Stacy Peterson. She is still missing. One year ago: In August 2010, based on a tip, searches for Stacy’s remains took place near Peoria. No evidence was found. Two years ago: Still missing with no sightings or communication from her. Three years ago: Missing. No communication from her since October 28, 2007. Searches were ongoing. We thought it might be time for an update while we await the decision from the Appellate Court reconsidering Judge White’s choices regarding certain hearsay statements, so here you go. Also, we’re following an interesting report about some skeletal remains discovered along I-55 yesterday, only 20 minutes from the house shared by Drew Peterson and Stacy Peterson. Please, check the comments page for updates as we learn more. • The many airings of the Lifetime movie “Drew Peterson: Untouchable” renewed interest in the missing person case of Stacy Peterson. An influx of tips and offers of assistance brought on new searches. • Rumors surfaced of a biography of Kathleen Savio being written by a distant relative. • The Illinois Supreme Court approved four counties to take part in testing out the use of cameras in trial court rooms. The four counties are Henry, Mercer, Rock Island and Whiteside (the 14th district). Will County (the 12th district) is also considering applying to take part. • The Raven Theatre in Chicago premiered a play called “Dating Walter Dante“. The play is loosely based on the private life of Drew Peterson, or more specifically the idea of dating a man suspected of killing two wives. • Stephen Peterson’s next court date in his appeal to get his job back on the Oak Brook police force was continued to June. • The bathtub drowning death of Whitney Houston reawakened media scrutiny of the manner of death of Kathleen Savio. It was pointed out once again that only an unconscious person could drown in the tub and that the coroner’s opinion in Savio’s second autopsy was that the gash on her head was not severe enough to result in loss of consciousness. • Kankakee County (The 21st Circuit Court) approved the use of cameras in trial cases. • Gossip columnist Michael Sneed reported that Peterson has about a dozen pen-pals and that four of them routinely put money in his commissary account. • Faithful Drew Peterson friend, Steven Carcerano, was arrested and charged with domestic battery after an altercation in which he forced his brother from his car. • A routine “flipping” of Peterson’s jail cell turned up a few too many plastic spoons and an extra cereal bowl. • Partially clothed skeletal remains were found by a utility worker in a grassy area south of the I-55 expressway just north of La Grange Road. Waiting on identification.